In the Age of the Lawsuit, maybe this was the inevitable result of a couple of trees on Albany’s Cox Creek coming down in a windstorm two weekends ago. On Saturday these signs had appeared at the western entrance of the Cox Creek Path. The path was not really “closed’ in the sense that people could not use it. They could simply step around the signs here and, on the other side, near the passage under the Portland & Western and Union Pacific tracks. 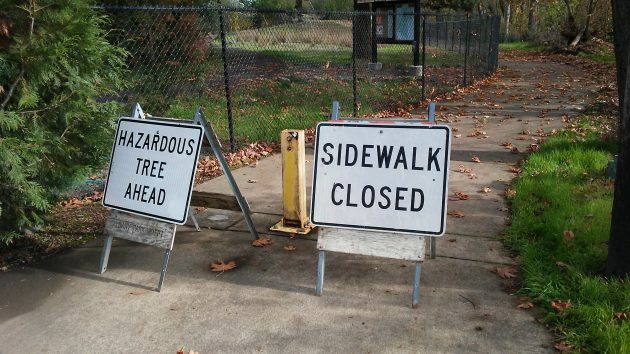 If there were hazardous trees on the section of the path bracketed by the warnings, they were not easily seen. The cottonwoods and others, some of them tall and apparently dead, looked no different than before. Two weeks ago, two cottonwoods crashed across the path and took out sections of the Talking Water Gardens fence. One of the breaks has been fixed. The path, from the Simpson Park parking lot to Salem Avenue near Waverly Park, is one of my bike routes. After I saw the wind damage the other day, I wrote that there were other tall trees there, so watch out if there’s s strong blow from the south. What part of “CLOSED” don’t you understand. If a business hangs a sign on their door saying “Closed” is it not “really closed”? Some people will ignore the “Sidewalk Closed” sign, proceed, and then, if they are injured in some way turn around and sue. For crying out loud if it’s “Closed” it’s closed. Use some common sense and find another route until the sign comes down. You truly exist in “an earlier time,” a long passed era when litigation was not the blood sport it is today. But, had the common man known then what the same knows now, perhaps the level of litigiousness we currently witness would have grown commonplace far sooner. But all that is mere wishful thinking. We live in the hard-nosed Hering World, a topsy-turvy universe where a bicyclist injured as a result of his/her own foolishness can and will turn table, suing the City for their malfeasance for not having identified the potential disaster ahead and provided sufficient warning…the very thinking you pooh-pooh in your discussion on the matter. Any entity that can afford it (in this instance, the City) must insure themselves against those who have the wherewithal to sue on spurious notions. When one considers how much money the average 10-speed Town/Touring bicycle costs, and the earning power required to be able to afford to dally-about Albany on said bike, one must conclude that, in this instance, the City was only indemnifying itself against the people occupying the upper middle class strata…the very people who seem most likely to bring suit for something as “innocent” as this. Hence, the absurdity of warning signs that warn against nothing.